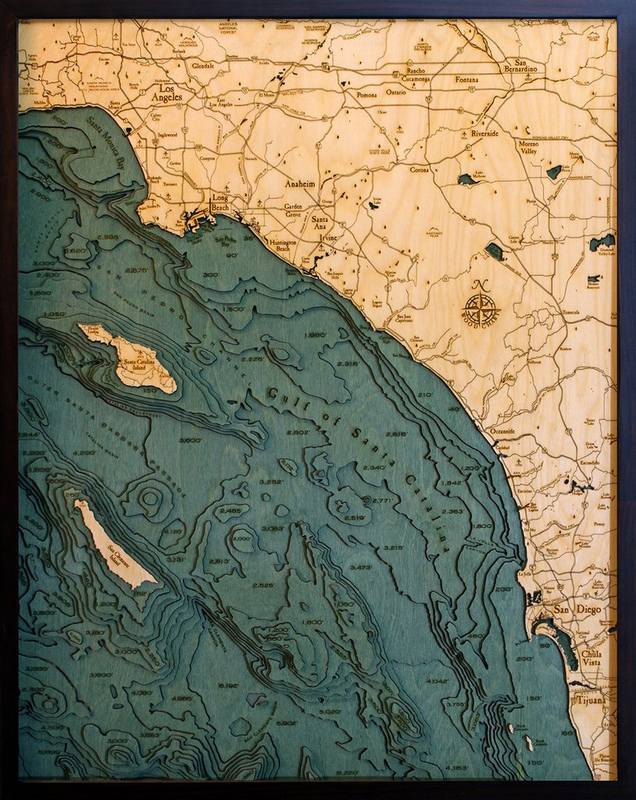 Starting with a bathymetric chart (the underwater equivalent of a topographic map), laser-cutters are used to carve the contours into sheets of Baltic birch and glue them together to create a powerful visual depth. Select layers of blue are hand-stained to discern land from water and major byways are etched into the land. Each piece is framed in a solid-wood frame and protected with a sheet of durable, ultra-transparent Plexiglas. Available maps are the Monterey Bay, Santa Barbara and the Channel Islands, Baja California, the Salish Sea, Catalina Island, the Hawaiian Islands, Maui, Oahu, Huntington Beach, Malibu, and Los Angeles to San Diego (pictured above). Click HERE for images, pricing and sizes.